It's chive season again. I've got a couple of big chive plants, one of which is an offspring of one from my grandmother's garden in upstate Pennsylvania. My mother took a clump from her mother's garden while I was still in college; I drove Mom home with the plant in the back of the car, along with a small armchair for my dorm. When Mom and Dad downsized to a smaller home, she dug a clump and planted it in her new yard. She divided a piece off and gave it to my for my rocky first garden. I've divided clumps from that original plant three times, until Mom's home was sold. The one I have in my current garden was snitched from my ex-husband's yard while he was at work. I may have split from the guy, but I wasn't leaving my chives. So I still have some of my Mom-Mom's chives. If I ever move again, they'll go along. It's my Chive Jive. Last year I was all about the flowers. 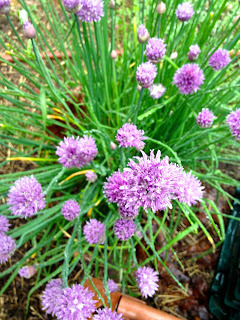 Chive flower vinegar is a wonderful thing; you can find instructions here. I scatter those pretty purple, edible flowers over anything I want to have a faint onion flavor; after all, chives are a perennial allium, which means they are in the onion family. They are wonderful, the mildest and most well-mannered onion you'll ever meet. But it's those long, green leaves, with their mild, but pungent onion flavor that I just adore. I first loved them as a kid-- while other little girls were eating PB&J in the school cafeteria (this was before all the allergies) I was chowing down on thin white bread with cream cheese and chives. I was one weird kid, I guess. Chive season starts early, and thank goodness it lasts pretty much all summer. You can find them bundled into bunches in most farmer's markets starting in May, but you can easily get a small plant at the garden center, and with very little care, you can start your own family tradition...er, Chive Jive. On Friday I came upon White Lily Self-Rising Flour (finally! ), which happens to be my favorite biscuit making flour at my local Wegman's, and ran home with a chunk of old Vermont cheddar cheese to make these cheddar - chive cream biscuits for dinner. I ate three. Too good, so you should try them. Chives and cheddar cheese are a wonderful combination. I start salivating just thinking about the leftovers in the kitchen. I may have to excuse myself for a biscuit break. Cream biscuits are good to try for your first attempt at biscuit making. Instead of having to cut in shortening or butter, you just use heavy cream, which has enough fat in it to make a good biscuit. The texture is shorter in a cream biscuit,-- a little more cakey than flakey, but the dough is far more forgiving. Never roll the dough out more than two times. Whatever you have left after that, just toss it our. Over handling biscuit dough is a bad thing; it develops too much gluten and makes them tough. Note: I've had my little old 2" biscuit cutter so long, I used to cut out Play-Doh with it. If you don't have a 2" cutter, try using a smallish drinking glass, or just cut them in squares with a knife -- less waste! 1. Preheat the oven to 450ºF. Cover a baking sheet with baking parchment or a Silpat. 2. 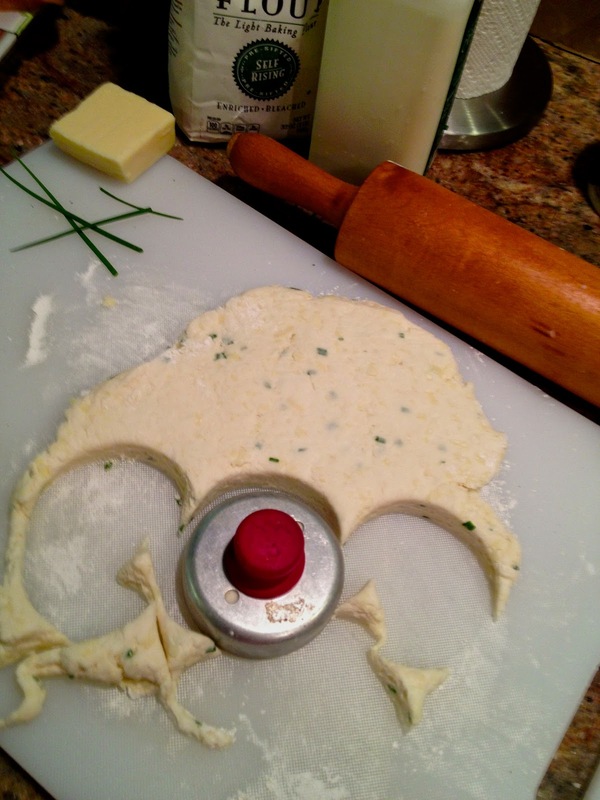 Mix the flour, the garlic powder, salt, chives and cheese in a large mixing bowl. Stir in the cream, gently with a silicone spatula, until all the dry ingredients are moistened. If there are any dry patches, dribble in a bit more cream until the dough is just slightly sticky. DO NOT OVERMIX. Let the dough sit for about 5 minutes. 3. Turn the dough out onto a lightly floured board and gently pat or roll the dough until it's 1/2" thick or just a bit thicker. Cut each biscuit out with a 2" round cutter, dip in the melted butter, and place about 1/4" apart on the parchment or Silpat-covered baking sheet. 4. Bake about 12 minutes until golden brown and well-risen. Remove to a napkin lined bowl, spread with butter and devour. of Mom-Mom's original Chive plant.